Certified Income system found at certifiedincome.co promises to make you money without any work from your side. Is it too good to be true? More importantly, is Certified Income a scam? Let’s find out the shocking truth in our Certified Income review. 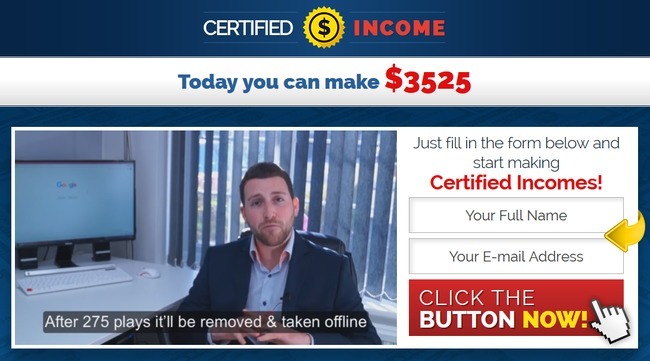 The Certified Income scam (yes, it is a scam) found at certifiedincome.co makes a bold guaranteed as soon as you enter their sales page. You are promised to make $3525 at the very same day you sign up for their “free” system. Anthony Cahill, the alleged owner of Certified Income system says that he is giving away his money making system for free, and you are one of the lucky viewers that is “specifically chosen” for this life-changing opportunity. You are told that the sales page will be taken down after the spots have been filled up, and they are running out quickly. Stay vigilant and don’t be fooled, as Certified Income scam is certainly not free, and none of the promises they make is true. Not only that, Anthony Cahill is not a millionaire like he claims to be. Instead, he is a Fiverr actor who offers his service to read any script like a testimonial. 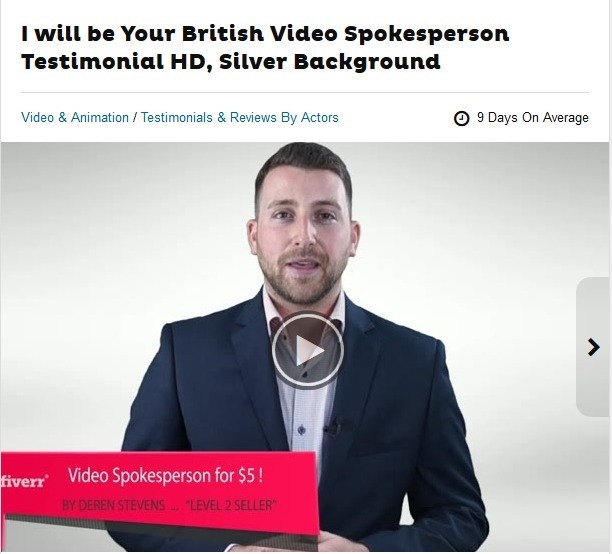 A fake testimonial can generally be bought at Fiverr.com for just $5. I do not condone or condemn the act of buying and selling fake testimonials, but I want you to be aware of this – that fake testimonials can easily be bought online. Now secure your wallet and read on, as we reveal more truths about Certified Income scam, and guide you to the legitimate way to make money online. Before we continue the review, I want to briefly explain how binary trading works to make sure everyone is on the same page. If you have experience trading binary options, you may skip this segment. Binary trading is gaining momentum in recent years due to its simplicity. You don’t have to read financial news and analyze complicated charts. With binary options, you only guess if the price of an asset will rise or fall after a short period of time, usually between 30 seconds to minutes. There can only be 2 outcomes – either you are right, or you are wrong. There is no middle ground (hence the name binary options, or 2 options). This is how it works – let’s say I feel that the exchange rate of EURUSD will fall 5 minutes from now, and I bet $50 on a 5-minutes contract. When the time is up, and the rate is indeed lower, I win a certain percentage of what I bet, usually between 60% to 80% ($30 to $40). But if I’m wrong, I lose the entire $50 that I bet. In practice, trading binary options is the same as gambling. Just like guessing the outcome of a coin toss, there’s no way to guess the outcome of market movement in such a short period of time. Most of the time, traders guess blindly and depend on pure luck. There’s no way to win consistently. Even if you manage a 50% win rate, you’ll still lose money due to the uneven winning vs losing payout of binary options. Even the renowned finance website, Forbes warns you against gambling on binary options. How Certified Income System Works? Back to Certified Income scam. Why did we talk about binary options? That’s because Certified Income system is a software that gambles on binary options on your behalf. 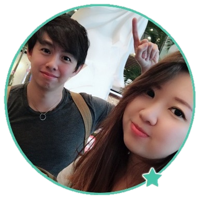 Anthony Cahill wants you to believe that he has engineered a fully automated system that trades binary system on your behalf, which will generate consistent income for you on a daily basis. He uses words like “guaranteed” and “free” to lure you into thinking that there is no risk at all using Certified Income system. But that is simply not true. Let’s find out the truth behind the flashy sales material and sugar-coated promises of Certified Income scam. The truth is in the disclaimer. But how many people actually read it? Despite giving you multiple guarantees to make you rich, Anthony Cahill and Certified Income scam have some secrets hidden in their disclaimer, after all. The link to the disclaimer can be found at the bottom of their sales page in fine prints, but how many people actually click into it and read it word by word? Not a lot. You could sustain a loss of some or all of your initial investment. Clearly understand this: information contained in this product are not an invitation to trade any specific investments. Trading requires risking money in pursuit of future gain. That is your decision. Certified Income system is not free. There will be investment required, and you will likely lose your investments. Despite giving you multiple guarantees to make you rich, you are on your own if you use Certified Income system and lose all your money. It is your decision, and your responsibility. 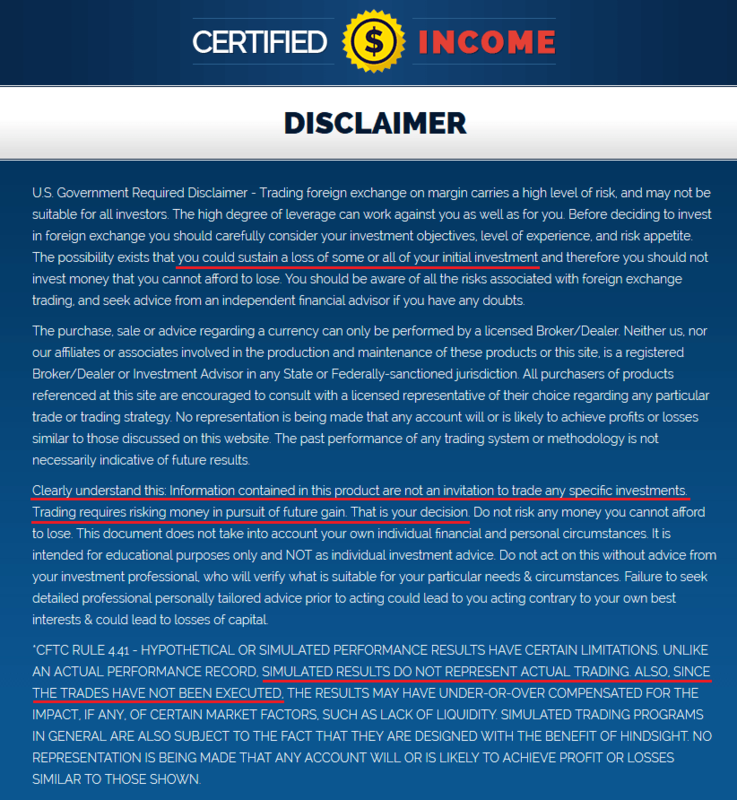 THE TRADES (portrayed in Certified Income sales material) HAVE NOT BEEN EXECUTED. Fact #3 alone should be enough to alert you to steer clear of the scam. There is no actual trading done with Certified Income system, and all the profits Anthony Cahill has been boasting are fake! If you think Certified Income includes such terms as a fair warning to their potential consumers, think again. The sole purpose of this disclaimer is to protect themselves from legal actions when you lose all your money using the scam software. If they wanted to be honest about the risks of binary trading, and the fact that no trades have been executed using the system, they would’ve told you in the sales material. Instead, they chose to present you hypes and fake promises. 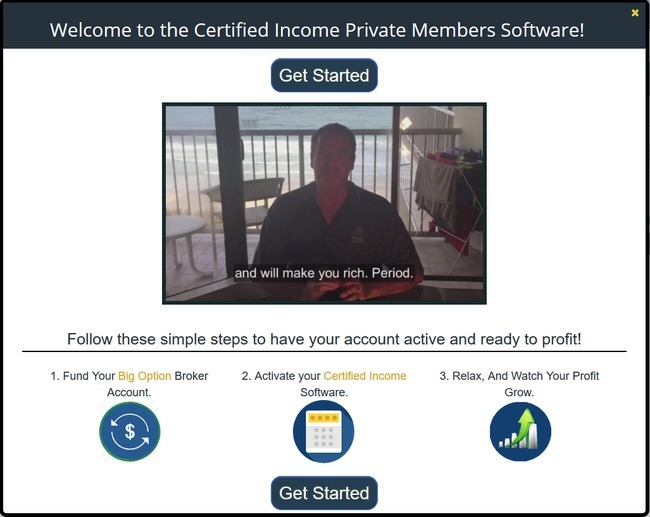 If you decide to use Certified Income software, you’ll need to register for a broker account in their sales page (which is an affiliate link). Anthony and the scammers behind Certified Income system will earn a sum of referral fees as soon as you make your first deposit. I was assigned to Big Option broker, but you may be assigned to different brokers depending on your country and location. The typical minimum deposit for these brokers is $250. Keep in mind that you can only use Certified Income system with their affiliated brokers. Even if you already have an account with one of their affiliated brokers, you’ll need to register for a new one using a different email address. This is because the scammers behind Certified Income system cannot collect their referral fees if you do not sign up through their affiliate link. And what happens when you finally deposit the money and lose all your money using Certified Income automated software? You are left on your own and you cannot take any legal actions against the scammers, because it is already stated in the disclaimer that using the software is your own decision. Is Certified Income a Scam? YES, CERTIFIED INCOME IS A SCAM. As we’ve said in the review earlier, we don’t recommend binary options trading as a way to make money online, at all. It’s not that different from gambling, and using an automated trading software is no different. You are essentially putting your hopes and entire investment in a piece of software that gambles on your behalf.